Brazilian President Jair Bolsonaro has touched down in Israel with a decision pending on his controversial move to relocate his embassy to Jerusalem, and as his ally, Israeli Prime Minister Benjamin Netanyahu is facing tough elections in a week. 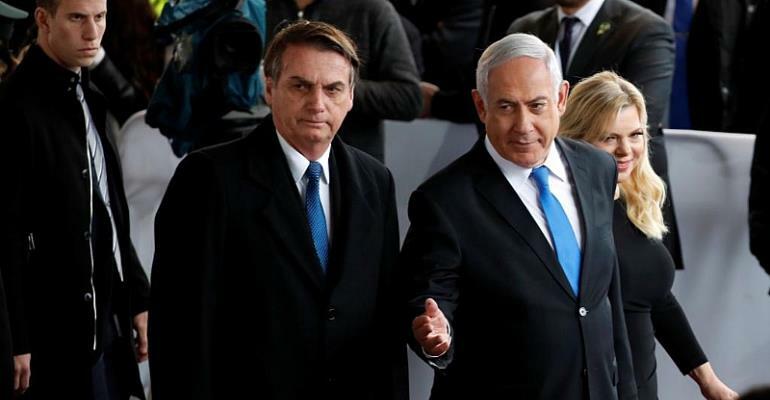 Bolsonaro was welcomed by Netanyahu and an official ceremony at the airport near Tel Aviv on Sunday. He will walk a diplomatic tightrope during the three-day visit as he seeks to shore up ties with Netanyahu while avoiding angering key Arab trade partners. Bolsonaro's controversial pledge to move Brazil's embassy to Jerusalem is expected to be high on the agenda, as Netanyahu uses the occasion to boost his standing ahead of 9 April elections. Bolsonaro has suggested he was in no hurry to make a decision. "Trump took nine months to decide, to give his final word befire the embassy was transferred," Bolsonaro said. "Perhaps for now we will open a commercial office in Jerusalem." While moving the embassy would please Bolsonaro's evangelical Christian support base, it would run the risk of provoking commercial retaliation from Arab states, some of which are major importers of Brazilian meat. Netanyahu became the first Israeli prime minister to visit Brazil when he travelled there for Bolsonaro's 1 January inauguration. In their discussions then, the two right-wingers talked up their budding "brotherhood" which they said would boost military, economic, technological and agricultural cooperation. Bolsanaro's visit to Israel coincides with planned street protests against a court decision to allow commemorations of Brazil's 1964 military coup that established a 21-year dictatorship – as requested by the president, a right-wing former paratrooper, last week.